Following plethora of rumors and leaks, Samsung announced the launch of two mid-range smartphones in its Galaxy A lineup. 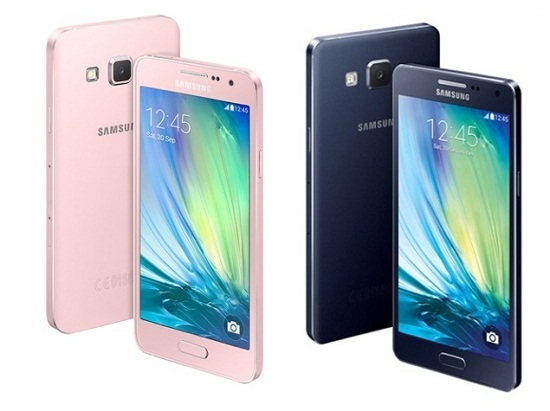 These new smartphones – Galaxy A3 and Galaxy A5 boast premium aesthetics with metallic unibody build and slim aesthetics. The Galaxy A5 and A3 are the slimmest smartphones launched by the vendor till date and they measure 6.7 mm and 6.9 mm in thickness respectively. While the South Korean tech giant has not announced the pricing of these smartphones, it is announced that they will go on sale in November. Talking of specifications, the Galaxy A5 is given a 5 inch Super AMOLED display and comes equipped with a 1.2 GHz quad-core processor of unspecified chipset. Running on Android 4.4 KitKat operating system, the smartphone comes with 16 GB of storage space that can be extended externally by another 64 GB and 2 GB of RAM. When it comes to the imaging aspects, the Galaxy A5 features a 13 MP primary camera that is teamed up with LED flash and FHD 1080p video recording ability. There is also a 5 MP front facing selfie camera onboard. Other aspects of the Galaxy A5 include 4G LTE, 3G, Wi-Fi, Bluetooth 4.0, GPS/ GLONASS and NFC (only for the LTE variant) for connectivity and a 2,300 mAh battery. The Galaxy A3, on the other hand boasts of a 4.5 inch qHD Super AMOLED display that boasts a screen resolution of 960×540 pixels. While the processor, storage and connectivity departments are similar to those in the Galaxy A5, its smaller kin comes with 1 GB of RAM instead of 2 GB. The Galaxy A3 flaunts an 8 MP primary camera at its back accompanied by LED flash and FHD 1080p video recording. There is a 5 MP front facer as well as in the Galaxy A5 and a smaller 1,900 mAh battery. Both the smartphones are packed with software aspects including Ultra Power Saving Mode to enhance the battery backup, Private Mode and Multi-Screen. Also, the adjustable audio feature adjusts and enhances the sound output depending on the user’s surroundings. The handsets come in different color options such as Pearl White, Midnight Black, Platinum Silver, Soft Pink, Light Blue and Champagne Gold.